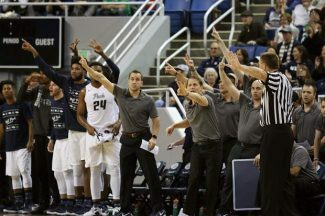 The Nevada bench reacts to UC Davis having 3 seconds left on the shot clock in the first half of a game on Tuesday, Dec. 19, 2017 in Reno. The Nevada basketball team faces Southern Illinois on Friday in Las Vegas at the Continental Tires Classic. Here’s a breakdown of the game and notes. Of the Pack’s 1,001 points this season 60 (604-of-1,001) percent is from first-year players. The Martin twins, Caleb (18.5) and Cody (14.3) have combined to score 32.8 points per game which is 39.2 percent of the Pack’s offense… After dropping two in a row Nevada has won two straight by 15 points each (Radford and UC Davis) … Jordan Caroline scored 20 points in the win over UC Davis giving him three consecutive 20-point games, five in the last six games, seven times on the season and 19 total in his career. In the last five games he has 57 rebounds … After missing the first six games of the season with a broken wrist, Saint Louis transfer G Marcus Bartley (6-5, 193, Jr.) has established himself in the starting lineup as the team’s point guard. He has 23 assists and 12 turnovers since returning … Kavion Pippen is the nephew of ex-Chicago Bulls great Scottie Pippen.